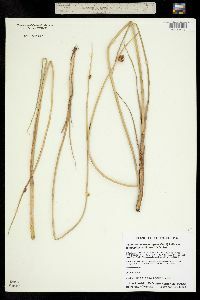 Rhizomes often vertical, 1-6 mm diam., firm to hard; scales shorter to longer than internodes, disintegrating to fibers. Culms sharply trigonous, sides convex to concave proximally, deeply concave to flat distally, 0.1-2 m × 1-6 mm, smooth. Leaves basal; sheath fronts membranous distally, orifice adaxially truncate to concave, often splitting; ligules 2-fid, 1 mm; blades 2-6, proximally V-shaped, distally trigonous to asymmetrically laterally flattened in cross section, angles often scabridulous distally; distal blade (1-)2-5 times as long as sheath, 50-750 × 2-9 mm. Inflorescences capitate; proximal bract usually erect, resembling leaf blade but trigonous proximally, (1-)3-20 cm. Spikelets 1-5(-10), 5-23 × 3-5(-7) mm; scales bright (to very dark) orange-, red-brown, or purplish brown to straw-colored, often prominently lineolate-spotted, midrib mostly paler, ovate, 3.5-6 × 2-3 mm, smooth or awn sparsely spinulose, margins deciduously ciliolate, flanks ribless except sometimes proximal scales, midrib prominent, apex acute (to obtuse), 2-fid, notch (0.3-)0.5-1 mm deep, awn mostly irregularly bent, 0.5-1.5(-2.5) mm. Flowers: perianth members 4-8, sometimes fewer, brown, bristlelike, variably slender to stout, equal or unequal, all equaling achene body to all rudimentary, retrorsely spinulose; anthers 2-3 mm; styles 2-3-fid. 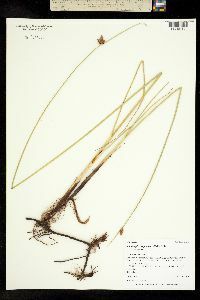 Achenes brown, biconvex to compressed bluntly trigonous, obovoid to obpyriform, (2-)2.5-3.5 × 1.3-2.3 mm; beak 0.1-0.5 mm. 2n = 74, 78. Fruiting spring-summer (south), summer (north). Fresh to brackish shores, marshes, lakes, fens, often emergent in water to 0.7 m; 0-2400 m; Alta., B.C., Man., N.B., Nfld. and Labr., N.S., Ont., P.E.I., Que., Sask. ; Ala., Alaska, Ariz., Ark., Calif., Colo., Conn., Del., Fla., Ga., Idaho, Ill., Ind., Iowa, Kans., Ky., La., Maine, Md., Mass., Mich., Minn., Miss., Mo., Mont., Nebr., Nev., N.H., N.J., N.Mex., N.Y., N.C., N.Dak., Ohio, Okla., Oreg., Pa., S.C., Tex., Utah, Vt., Va., Wash., Wis., Wyo. ; Mexico; West Indies; South America; Europe; Australia (including Tasmania); New Zealand. 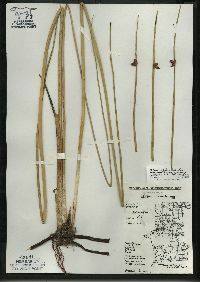 Three varieties of Schoenoplectus pungens (under Scirpus americanus) were recognized for North America by T. Koyama (1963), and three more or less equivalent varieties were recognized by S. G. Smith (1995). These varieties are described informally and illustrated here but not formally recognized because their morphologic delimitation should be evaluated and their exact ranges are still uncertain. 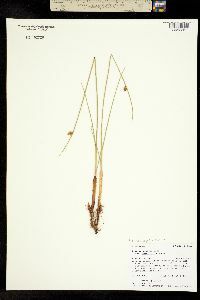 Schoenoplectus pungens (Vahl) Palla var. 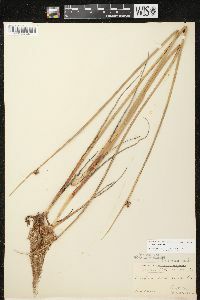 pungens has brown to straw-colored spikelet scales, bifid styles, and lenticular achenes. It is the only variety that occurs in Europe and North America. In North America, it extends from the Atlantic Coast to Saskatoon and is reported from Arkansas, Kansas, Louisiana, Minnesota, and Missouri. 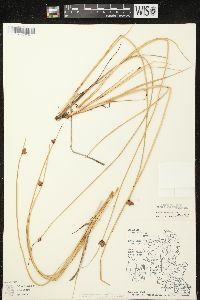 Schoenoplectus pungens (Vahl) Palla var. longispicatus (Britton) S. G. Smith has bright orange to reddish (or purplish) brown or often stramineus and lineolate-spotted spikelet scales, trifid styles, and trigonous to lenticular achenes. 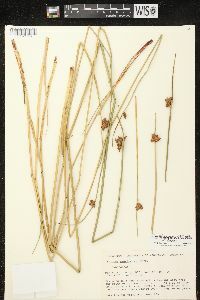 Endemic to the flora area, variety longispicatus occurs in western North America, except Pacific Coast, east to Saskatoon, Manitoba, and Ontario, along the north shore of Lake Superior, south to Iowa, Minnesota, western Wisconsin, Missouri, and southern Mississippi. 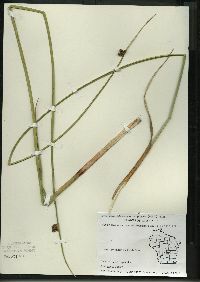 Schoenoplectus pungens (Vahl) Palla var. badius (J. Presl & C. Presl) S. G. Smith has uniformly dark chestnut spikelet scales, trifid styles 3-fid, and trigonous or thickly biconvex achenes. In North America, variety badius occurs along the Pacific Coast (to slightly inland) from British Columbia south to California. Outside the flora area it occurs in Baja California, Mexico, temperate South America, Australia, including Tasmania, and New Zealand. 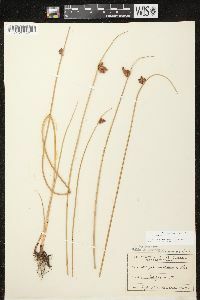 The name Scirpus americanus [subsp. monophyllus (J. Presl & C. Presl) T. Koyama] var. monophyllus was misapplied to Schoenoplectus pungens var. 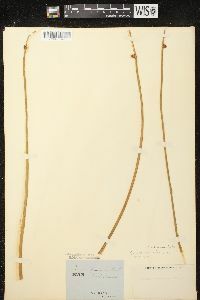 badius (T. Koyama 1963). 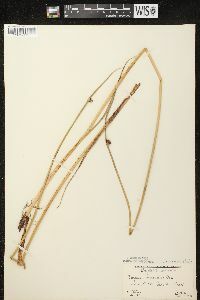 The type of the basionym Scirpus monophyllus J. Presl & C. Presl from Peru belongs to Schoenoplectus americanus (S. G. Smith 1995). 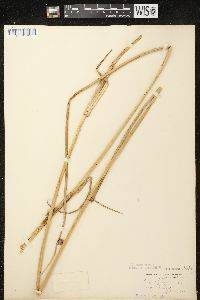 Schoenoplectus americanus, S. pungens, and S. deltarum belong to the small 'Scirpus americanus complex' T. Koyama (1963), in which the species are sometimes difficult to delimit. 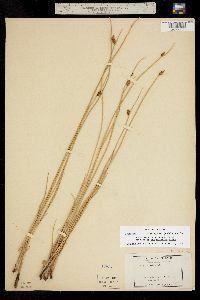 Schoenoplectus pungens was long known incorrectly as S. americanus Persoon; the type of that name is conspecific with plants formerly treated as S. olneyi A. Gray (A. E. Schuyler 1974). Putative Schoenoplectus pungens × S. americanus hybrids [= S. ×contortus (Eames) S. G. Smith] are locally common. 2n = ca. 86-128. Perennial herb with vertical, 1 - 6 mm wide rhizomes, colonial 10 cm - 2 m tall Leaves: basal. Sheaths sometimes concave at the mouth, often splitting, the fronts membranous above. Ligules 1 mm long, two-cleft, membranous. Blades firm, two to six, basally V-shaped in cross-section, three-sided to asymmetrically laterally flattened towards the apex, parallel-veined. Upper blade 5 cm - 0.75 m long, 2 - 9 mm wide, two to five times as long as sheath. 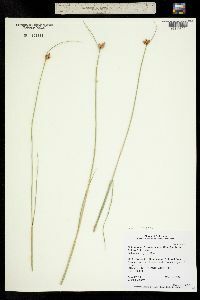 Inflorescence: composed of one to six spikelets, terminal, compact, subtended by bracts. 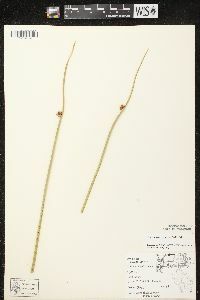 Lowest bract often upright, green, 3 - 20 cm long, sharply pointed. Flowers: minute, subtended by a floral scale, lacking sepals and petals, bearing four to eight bristles. 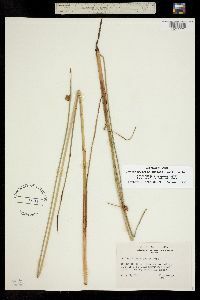 Bristles stout to slender, brown, often unequal, equal to achene body or sometimes lacking, strap-like, bearing small spines. Stamens three, exserted. Anthers 2 - 3 mm long. Pistil one. Style linear, two- or three-cleft. Fruit: a one-seeded achene, brown, 2.5 - 3.5 mm long (including beak), 1 - 2 mm wide, reverse pear-shaped to reverse egg-shaped, beaked, biconvex to bluntly three-sided and flattened. Culm: 10 cm - 2 m long, 1 - 6 mm wide, sharply three-sided (sides flat to slightly concave or convex), solid, internally spongy with air cavities. 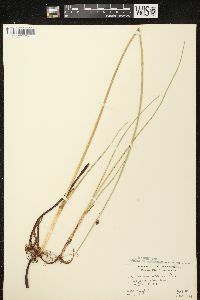 Spikelets: more or less stalkless, 0.5 - 2 cm long, 3 - 5 mm wide, circular in cross-section, with eight or more floral scales. Floral scales spirally arranged, orange or reddish brown or purplish to straw-colored with a brown midrib and tiny lines or spots, 3.5 - 6 mm long, 2 - 3 mm wide, egg-shaped with a rounded or pointed and notched apex, awned, thin, deciduously minutely hairy-fringed. Habitat and ecology: Locally abundant along the marshy borders of streams and ponds. Also found in ditches along highways. Etymology: Schoenoplectus comes from the Greek words schoinos, meaning rush or reed, and plectos, meaning twisted, plaited, or woven, referring to the use of the culms for making useful objects. Pungens means pungent. Frequent on the sandy shores of lakes and on gravelly bars in streams.